Lightweight yet strong and durable, the 7ft. light duty 1.12lb per foot steel U Channel sign post comes with a galvanized finish that further increases protection from rust and weather over the baked enamel green posts. 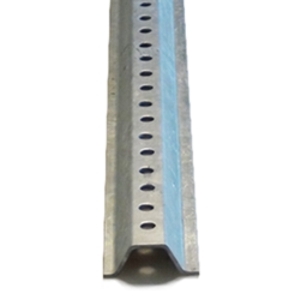 Posts are tapered on one end for easy ground installation. 7 foot posts are an ideal choice for use with reflective delineators, markers, buttons, or for small sign projects. 2-3ft of post in ground can suitably hold a small sign 4-5ft above ground level.